Manchester United may have to start thinking about looking to the transfer market to replace Paul Pogba before too long the way things are going. It’s not been a good start to the season for the France international, who was linked with a move away for much of the summer and who continues to attract speculation over his future. The latest controversy is Pogba giving an interview to Sky Germany where he failed to rule out leaving Old Trafford even in the next few months. United fans did NOT take this well, and who can blame them, so is it time for the Red Devils to have a plan in place to bring in a new midfielder as the 25-year-old looks to end his disappointing time in Manchester? 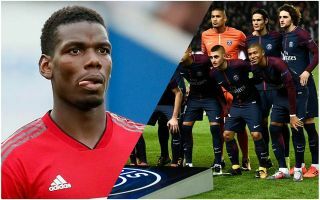 The Daily Mirror suggests this won’t be a big problem for United for the time being, but mention Barcelona and Juventus as possible destinations for Pogba as he’s likely to push for an exit again next summer. Linked with United several times in the summer, Don Balon maintain that Lazio starlet Sergej Milinkovic-Savic is a target for the Premier League giants. The Serbia international could be ideal to fill the void left by Pogba, having shown himself to be a real all-rounder in his time in Serie A. Widely regarded as one of the best up-and-coming talents in Europe, Milinkovic-Savic would certainly not come cheap, but United should be able to afford him, particularly with the money they’d raise from Pogba’s potential sale. Another of the very finest midfielders in the game right now, Toni Kroos might be more what United need in the middle of the park after the retirement of club legend Michael Carrick. Although they signed Fred for that role this summer, the Brazil international is inexperienced at the highest level after coming from Ukraine, and has been slow to settle. Don Balon have also linked Kroos as a potential Pogba replacement recently, and we can think of few who’d be better suited to the position. In a potential battle with rivals Liverpool (according to ESPN), United should perhaps also be in the running for Paris Saint-Germain midfielder Adrien Rabiot. The young Frenchman is an underrated talent with his best years ahead of him, and currently looks to be heading towards being available on a free transfer at the end of this season. United shouldn’t let such a talent move to a major rival like Liverpool, who have already done so well to strengthen in recent times with players United could really have done with, now arguably putting them ahead of the Red Devils in the running for major honours such as the Premier League and Champions League this season, which is quite a change from more modern history. At the moment there is no link with the 23-year-old, but it wouldn’t be too surprising to see that change if United were to lose Pogba and if his contract remains unsigned in the coming months.